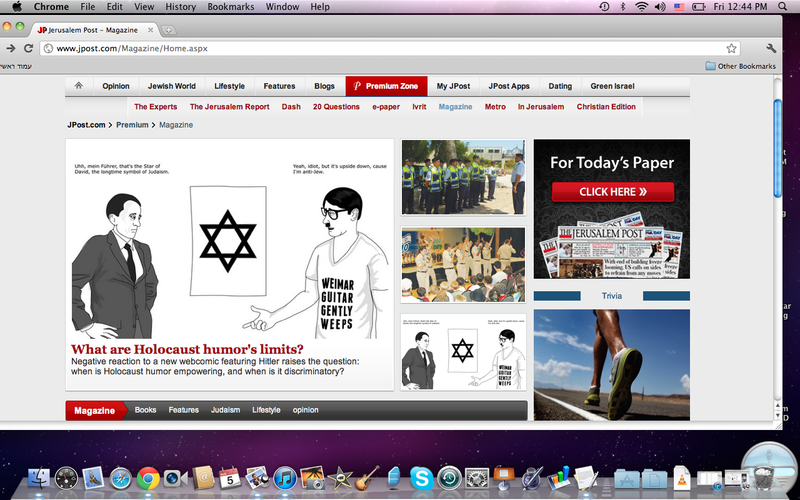 Holocaust humor piece published on Jpost website! I’m pleased to announce that my Hipster Hitler piece, titled, “What are holocaust humor’s limits?“, got published in the Jerusalem Post’s main magazine! (The link only works for subscribers, so I have copied and pasted the article below.) This piece was a real labor of love: it’s the most nuanced, investigative, in-depth piece I have done to date. I’m very proud of the piece and proud that it got published in a department at the Jpost with a larger audience. Plus, it’s one of the top three magazine articles featured on the Jpost’s website! What are Holocaust humor’s limits? Negative reaction to a new webcomic featuring Hitler raises the question: when is Holocaust humor empowering, and when is it discriminatory? What we laugh about often comes from our deepest pain. Because of this fact, the best comedians can also be the most controversial: look at Lenny Bruce, Richard Pryor and George Carlin, the three godfathers of stand-up comedy in the US. For the Jewish community, probably the most taboo example is Holocaust humor. For a long time, one couldn’t talk about the Holocaust, let alone make jokes about it. But Holocaust humor has gradually become a phenomenon among younger Jews. Some tell Holocaust jokes as a liberating way to deal with a traumatic past. Others still find it deplorable to depict Hitler as anything other than what he was. The newest Holocaust humor scandal concerns the webcomic Hipster Hitler. Just as Mel Brooks made light of the German dictator in the 1960s by portraying him as a hippie in The Producers, two daring Brooklyn-based writers have reinvented him as a modern day hipster – often defined as a young person who is counter-cultural, likes indie rock music, wears non-mainstream clothing, values irony, and probably lives in urban America. In the unusual webcomic, Hitler wears T-shirts with slogans like “Weimar guitar gently weeps,” “Under Prussia” and “You make me feel like danzig.” Some Jews find it funny, particularly those familiar with hipster subculture. Since the webcomic started last fall, it has spread quickly among many young Jews’ social networks. Some even dressed up as Hipster Hitler for Halloween, wearing Tshirts from the webcomic. Not surprisingly, other Jews did not appreciate the humor. The Australian Jewish community, which has the highest percentage of Holocaust survivors after Israel, found the T-shirts offensive. In June, the B’nai B’rith Anti-Defamation Commission successfully organized the removal of Hipster Hitler shirts from an Australian vendor’s website. For him and many others, the comic does not raise any red flags. In fact, its biggest fans find it empowering. One could argue similarly for why shows like The Daily Show or Saturday Night Live are funny: They poke fun at people with power. The creators of Hipster Hitler view the comic in the same vein. Well, Hitler certainly deserves it. The creators – who go by their pen names, APK and JC – admit the comic isn’t for everyone; it’s mainly for people who are aware of hipster subculture, especially New Yorkers. The idea for the comic came when the pair set out to create the most offensive website name. One of them said, “Hipster Hitler,” and they roared with laughter; the rest is history. As they started writing, they recalled, they began to realize how much Hitler had in common with hipsters: He was a vegetarian, a failed artist, an animal rights activist, and he made illogical decisions. Is this answer good enough for Holocaust survivors? According to some descendants, the answer is maybe not. However, another third-generation Holocaust survivor, camp counselor Michal Shamay, 22, from Rehovot, believes the debate should be about free speech and not the comic’s potential offensiveness. “As long as the Holocaust has not been forgotten, every form of art and humor is fine by me,” she said. Red Bubble, the online company that was selling Hipster Hitler T-shirts in Australia, also initially defended its actions by invoking freedom of speech. However, the B’nai B’rith commission’s concern was that the Holocaust would be forgotten if acts of incitement were tolerated. However, Anton Block, the chairman of the B’nai B’rith commission, explained that he did not find the comic anti-Semitic. “It wasn’t in any way speaking to stereotype Jews in a negative way. It wasn’t even a commentary on Jews at all. It was more about making fun of Hitler,” he said. In the case of the Hipster Hitler comic, he acknowledged, the audience knows the context: The website clearly explains that it is a satire about Hitler and hipster culture. Even if one might personally find it distasteful, the context is clear and not harmful to survivors. HOWEVER, THE T-shirts are a different story. According to Block, “when you see someone putting on a T-shirt, you might not realize this was coming from the comic. You might think it’s someone being serious. There might be a Nazi sympathizer who sees that and likes it. They could use it to make a political statement.” Furthermore, the T-shirts could easily be misread, no matter who was wearing them. The potential harm to survivors was too much for Block to ignore. After he received a handful of complaints about Red Bubble, the commission decided to approach the company. He also admitted that Brooks’s Jewishness made it better, adding that he didn’t know whether that was right or wrong, but that was how he felt. This sentiment is commonly heard among Jews, as well as among other minority groups: It’s better if the person telling the jokes about the group is an insider. As mentioned earlier, the creators of Hipster Hitler deliberately keep their identities anonymous. They also don’t believe they have to be Jewish to do this kind of humor. To APK, “A lot of art is about having multiple perspectives. When pressed about their identities, though, JC said, “Well, we can tell you that we’re both not Jewish. I’m Australian and APK is Indian. But neither of us are really anything. I try to refuse labels” – which, I pointed out, is very hipster of them. Apparently their lack of Jewish identity didn’t matter to the Jews I interviewed. The ones who didn’t like the comic still didn’t like the comic, and the ones who did, didn’t care. For Shamay, the writer’s identity was unimportant as long as the joke was told in the right context. Trichon went a bit further, declaring that “Jews don’t ‘own the rights’ to joking about Hitler” – i.e., the message is more important than the messenger. Holocaust humor may remain taboo, offensive and distasteful to many, especially those directly affected by the Holocaust. But the Hipster Hitler incident seems to show that the difference between amusement and discrimination comes down to making the context behind such jokes clear – as un-ironic as that may be.